Whilst researching HR Giger's artwork, I came across these little beauties: a creation by none other than the late Alexander McQueen. 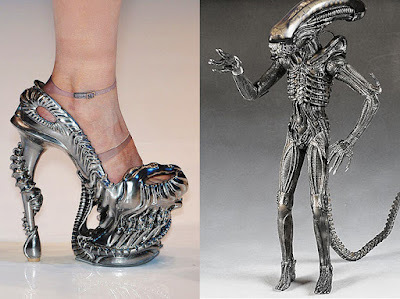 This one-off pair of heels was inspired by the creature from the Alien film franchise. They were made for a run way show, and sadly they are not available to purchase.